This Cardiac Trigger Monitor is a color monitor that displays a single ECG waveform, large heart rate, and alphanumeric characters for alarm messages, menus, user information. The monitor is compact and light weight, allowing for easier mounting solutions and greater flexibility. The Model has a universal power supply that operates from 100 to 230 VAC and automatically selects the correct ECG notch filter (50 or 60Hz) to reduce interference on the ECG signal. An optional integrated ECG simulator is available to test the integrity of the patient cables, lead wires, and electronic circuitry. An optional integral recorder may provide hard copy support documentation for clinical purposes. 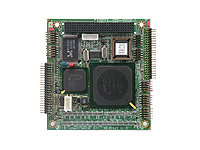 AR-B1622 is a PCI-104 form factor Embedded SBC with long life time support. It’s designed based on AMD LX 800 + CS5536 chipset and the CPU speed is 500MHz. Support both LCD and CRT monitors and with PCI-104 bus onboard can support the advanced PCI Bus PCI-104 Add-on modules for functionality expansion. It’s a very compact, long lifetime, cost-effective, easy-expansion products for Medical applications.